Good morning everyone. We are looking for your opinions. Presented in no particular order are 3 images created by our friend Marti Stone. Jen and I narrowed down a field of 100 images to these 3 and we need to go to press with our brochure in the very near future. So which image do you like best? Stoic, fun, laid back, the coast of Maine? These are a few of the words that may come to mind but we aren’t the ones looking at the brochure trying to decide which windjammer to sail on. Some of you have real life experience with marketing stuff like this. We will announce the winner when this goes to press next Monday morning (11/25/13) so you have to make a choice before then. The water mark (marti stone photography will be removed of course) and a few other blemishes can be removed. My hair is a mess! So we would love to hear from you either in the comments section of the blog, where we share on facebook or by emailing the global headquarters at captains@schoonermaryday.com. Just tell us which number you like best and we will take it from there. Thanks so much for your time and highly valued opinion. Posted in camden windjammer cruises sailing vacations, Windjammer Cruises in Maine and tagged Captain Barry King, Captain Jen Martin, Maine Windjammer captains, schooner Mary Day, Your Hosts on a Maine Sailing Vacation on November 20, 2013 by Capt. Barry. #2! Natural smiles and laughter can be seen on all six faces! I like the first one at the top! Can’t believe how your son has grown in only a year! Yes Sherry, he is huge. And with proper care and feeding he can be taught to do simple tasks. Love #2, but for a sailing brochure you need the ocean, so I choose #1! Love them all! I love the second one….it shows such spirit! #1 for the brochure, #2 for your Christmas card. They’re all great! I can’t believe these are the kids that played dress up bears with me on our trip- all grown up. Why choose just one- I agree the sea needs to be in the shot – I like #3, but #2 touches me like no other and should be included on the back of the brochure- or somewhere. No joy is greater than the smiles of the entire family. Love #2 – To me it says come on and join us for some relaxed fun. All of them are great pictures, but #2 shows more personality. I think your son has grown 6 inches since I was there in July! as a former Mary Day customer (twice) – love #1, need the coastline & Ocean! Number 2 most definitely! The other two are fine, but they are static, typical family portraits. Number two shows a bit of character and a family that likes to have fun with each other and will likely transfer that fun to their guests! (I’m biased because I’m a shutterbug, so I like different vs standard). # 2 Wow kids sure grow up fast. It was ’05 when we were there. Reading stories to the kids. I should say Gail was and doing all the drawings she did that trip. can’t wait to get back. All are great, but I would have to go with #2. It’s been 5 years since we saw the kids, my how they grow. #3 looks great! I can’t believe how big the kids are, I still picture them the summer I was on crew and we celebrated Sawyer’s 4th birthday! I like #1. But my reason for replying is Barry’s cool Portagee fisherman’s sweater. When I started working on the MD in 1976 we had several knitters among the women crew and Hawkin’s family friends. This pattern was very popular, so the girls knit these sweaters for the boys. Jim McGuinn, Ronnie and Haddy Hawkins and I all had them. I still have mine (in great shape) and I love using it each summer when I’m back in Maine because it always helps me connect my present with that wonderful past. Love #2 first, then #1…all are great pictures! I love #2 — it’s so animated and fun! My second choice would be #1, since it also “feels” friendly and warm. I like #2 — maybe you could change it up and have Barry on Jen’s back, and the kids on the dogs!!! #1, no doubt. 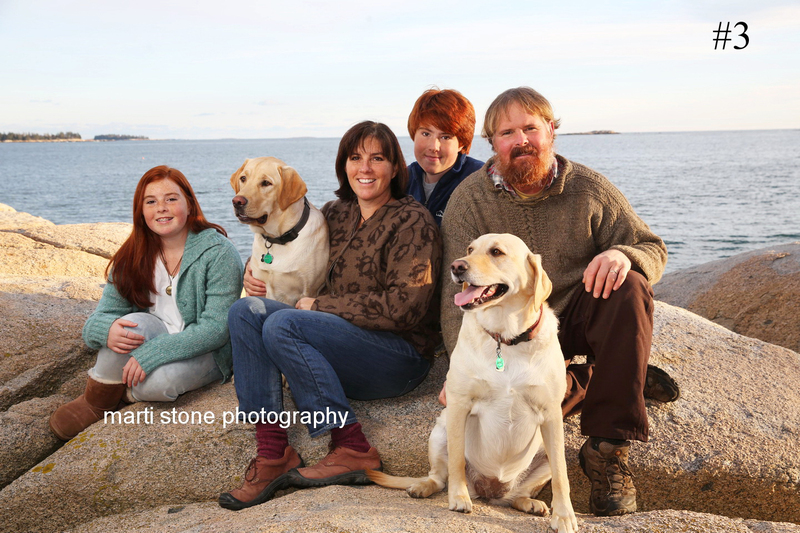 The family looks great, and the bit of rocky coastline shows you’re in Maine (or Norway!). I agree with a previous poster that #2 would work well on your Christmas card. And Jen, you get more beautiful with each passing year. You’re a lucky man, Capt. Barry! They’re all sickening. I mean seriously you guys couldn’t be more amazing. Miss you tons. Oh and I vote for #2!!!!!! Happy Holidays!!!!!! # 2 !!! The most fun, vital and real …… To my eye, that is! Have a wonderful holiday and will watch for you next year during the Sweet Chariot Festival. children get their red hair from. If I were trying to decide which windjammer to sail on, I’d go with the bunch in number 2. They look like the most fun. All three photos are really very good, but where did you get those BIG kids to pose with you?? We choose #1 – great shot!! Also love #2, Good Times :-D, even the dogs are laughing!!! I like photo no. 3. Very beautiful family photo! I’d want to sail with the folks that like #2. Number 1 is good ‘cept for the lobster bouy. 3 is sweet but formal. 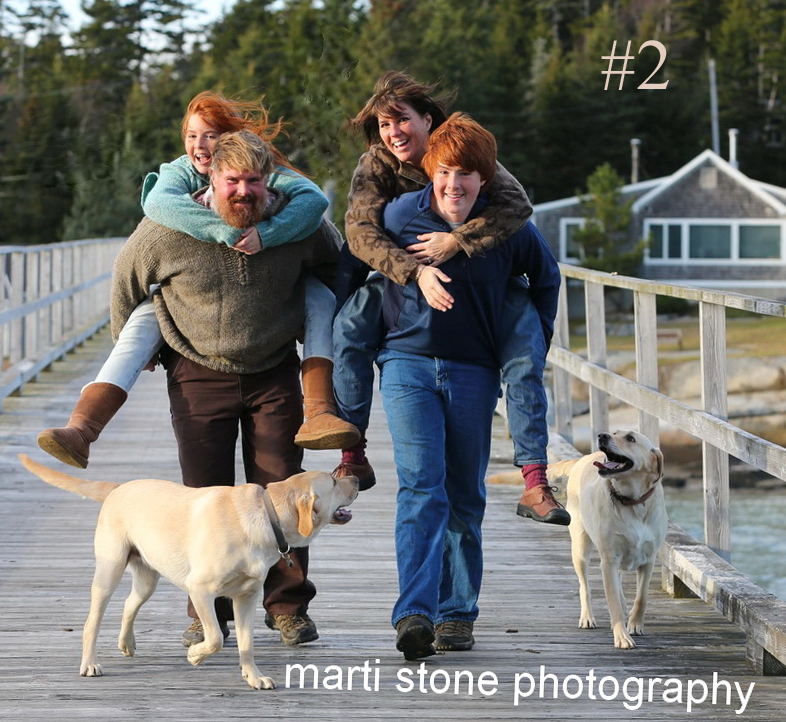 #2 looks like fun and adventure and people doing what they love to do. Comraderie, warmth and joy! Good luck for another good season. We like #3 the best. 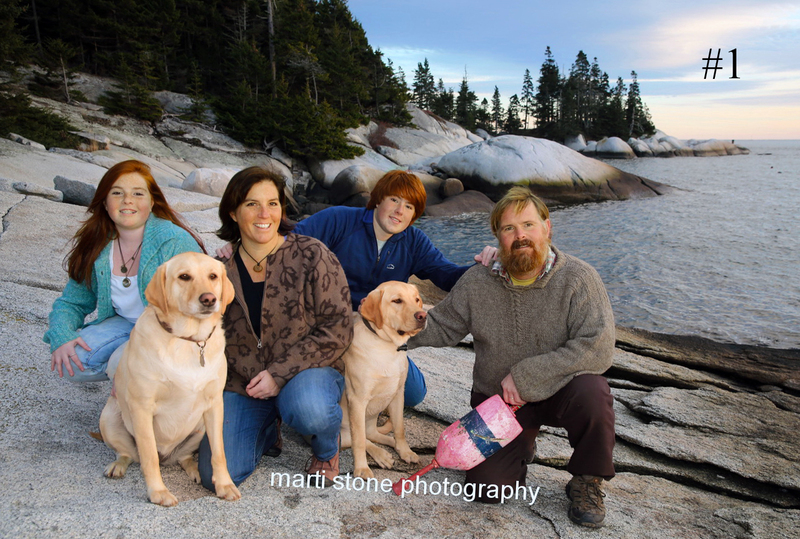 What a lovely family picture on the coast of Maine. I love #2! It’s very natural and it just has the real feel for you guys!!! Personally I like Number One. As to your hair….you Captain a Windjammer so how often isn’t it wind blown? Number one gets it all…. Family together on a Maine Island and compaired to most choices others have we’re all waiting on Fair Winds.